1. What are the goals of the program this year? The primary goal of our recreational U15 program is still to have fun! We'll continue to build on the strong fundamentals the girls have worked on in previous seasons, and we welcome anyone who's new to the sport who wants to play. We'll introduce more strategic and tactical concepts where the girls will learn how to employ their passing and catching skills on both the offensive and defensive sides of the ball. We'll emphasize establishing a settled offense and implement a few set plays. We will also place emphasis on a cohesive defensive strategy. We will continue to build on teamwork, camaraderie, and apply lessons we learn from lacrosse to life. We will not only provide our players with the opportunity to learn lacrosse, but also emphasize honoring the game, our teammates, and our opponents. 2. Who will coach the program? Beginning in the Spring 2019 season, all U15 coaches must be Level I certified through US Lacrosse. All GHL U15 coaches are Level I and II certified. Due to the increased popularity of lacrosse in our area, GHL will field two teams in this age group for the 2019 season. Team rosters will be finalized after registration closes. Parent volunteers will have the opportunity to support the teams in roles such as: sideline manager, timer, scorekeeper, field liner, and team parent. 3. When does the program begin and end? The U15 teams will start practice the week of February 26, 2019. Practice location and times won't be available until mid-February, but players can expect to have two 2-hour practices per week. Games will begin on March 17, 2019, and end with the End of Season Jamboree which will be held at the Starfire Complex in Tukwila, WA on June 1, 2019. Post-Season Opportunity: The decision to play in any post-season tournaments is left up to the coaches, parents, and players. They require additional fees that aren't covered by the GHLA registration. 4. What equipment do players need? Players without required equipment will not be allowed to practice or participate in games. 5. Do you have rental equipment available? 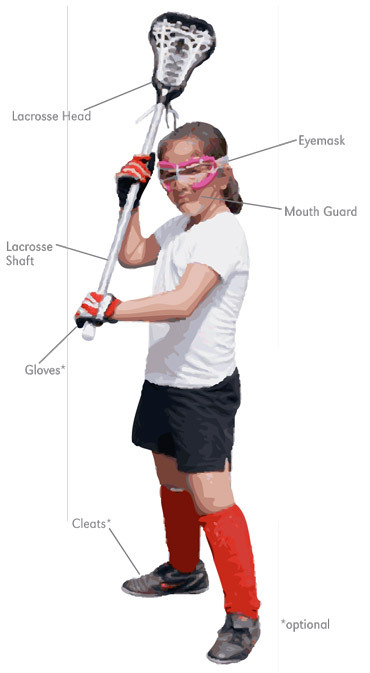 We do not provide girls lacrosse rental gear. We do provide all goalie protective equipment and stick for our goalies. If your daughter has the desire to play goalie please talk to one of the coaches. 6. Are physicals required? Are new concussion forms required? Physicals are not required at the U15 level. Concussion forms are required every year before players are allowed to practice. The club secretary will email forms to parents prior to the start of practice or you can download it from the GHLA website (www.gigharborlacrosse.com) under the “Documents” tab in the left menu bar. Signed concussion forms are required before players can practice and are good for one year from the date of signing.